Happy Sunday, dear poets! Now we know a black hole looks like the hole in a doughnut. Who knew? It was a great week at Poets United, starting off with our second Telling Tales prose feature. Tomorrow Magaly will chat with us a bit about the new Prose Pantry prompt, so do come back and join in the conversation. On Wednesday, Susan's prompt will be: Writing Prose! How timely. We can continue our discussion about this new avenue we are exploring. Scroll back if you missed Rosemary's excellent Moonlight Musings on Friday. The convo was all about writing poetry to prompts. Cool. For now, top up your coffee, add in some extra cream and sugar to sweeten the morning, and let's see what goodies await us in the Pantry. I am ready to enjoy poetry! Let's dive in. Good morning, poetry pals. Here, it is three in the morning. Looking forward to poetry! My goodness, Sherry!! You WERE up early. Hi Sherry! You need to go back to bed (smiles). I'm about to start digesting these offerings. Lol. I hope I will get back to sleep! Everyone is so quiet this morning. What's new? Maybe, everyone had gone to take a bite of the wormhole, in order to see it tastes like a doughnut hole, too. I really love the picture you shared. The look on the crocodile's face is a smile birther. Thank you for hosting, Sherry. And happiest Sunday, everyone! or rather, it's almost midnight here, and Monday is almost calling. It's always a pleasure to see you, Lee San. So nice to see you both. Yay....I made it here! I have such a hard time making it here on Sunday, but today was one of those days that worked out. Love that butterfly photo!! 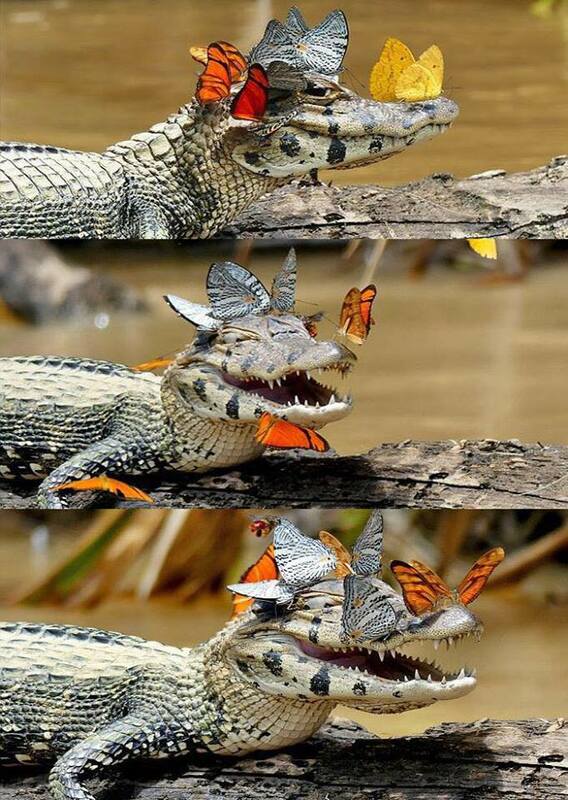 In the past I have tried to find cool butterfly photos to put on my blog, and this one would have been wonderful! It was on facebook, Carrie.....I really love it! So happy you linked your poem. It is WONDERFUL. I would have loved to have written it! I love your prompt, too, may give it a whirl, if not tonight, then tomorrow. Thanks for the share, Sanaa. I love Rosemary's Musings! Sanaa, I understand your need of sleep!! Smiles. Oh I forgot to say hello, though I have been out visiting! We are having a very snowy day here. Waiting for a breath of spring. Hope everyone has a poetic week. I cant get over your SNOW. The dogs must be getting very tired of it too.